We’d love your help. Let us know what’s wrong with this preview of The Lost Sentinel by Suzanne Rogerson. Tei, a tailor’s daughter, has always hidden her magic but when her father's old friend visits and warns them to flee to the mountains she must leave her old life behind. On the jo The magical island of Kalaya is dying, along with its Sentinel. To ask other readers questions about The Lost Sentinel, please sign up. It's so hard to explain what exactly this book is about, I think I couldn't do better than the synopsis and I'll not try it lol. The world building is incredible, it's my favorite aspect of the book and I think it's the best achieved. The descriptions are exceptional, without doubts. There are in fact a couple of deaths in the book and absolutely unexpected moments that have made me feel so bad! I didn't see anything coming and I didn't really expect to feel so touched by it, but I did. The writing style is very good I like how you can feel what is happening so intensely, you can feel when something is about to happen and that made me feel super hooked with the book. When a book makes you feel that kind of strong emotions is because it has done something right. It's quite dark, and I think it can work if you want to start that transition between YA-fantasy to Adult-fantasy. I recommend it a lot if you want to read an addictive fantasy, with a great world building, variety of characters and a unique magic aspect of which I don't want to talk much cause I think it will be fun for you to discover it on your own. The main plotline takes place in the world of Kalaya. On the one hand, we have the normal people ruled by the Assembly who have turned their back on magic and blame the fact that the land is dying on the people who wield it. On the other hand, we have the exiled magic-wielders who found their refuge in the mountains and build a home there. They are led by a powerful figure called the Sentinel, but the current Sentinel is dying and there needs to be a new one to safe the land from dying. I liked that this is a story where magic isn't necessarily seen as something good by the people of Kalaya, even if it's based on prejudice and ignorance. However, I would've liked more explanation about how this conflict came to be and how exactly this is connected to the island and its magic. The magic system itself is rooted in nature itself and the connection between all living things and the earth they live on. Some people are able to wield this magic and our main protagonist Tei is even able to traverse into the astral world where the spirits go to after death. I loved this harmonious, spiritual concept of magic and the fact that there needs to be a balance for everything in order to keep the island alive. The people connected to the island even see it as their duty to guide all spirits into the afterworld to ensure that they find their way and are reunited with the island. There is also another scenery that takes place on a very barren and unhospitable island called Stone Haven. The people who live there now had to flee their homeland because it was raided by pirates and they are now dependend on seafare to survive. This setting had a dystopian feel for me and it was very gripping to see how these people overcome their struggle and start a new life on this island that isn't very inhabitable. The characters and their development were the weakest point of the book in my opinion. We first follow Tei, who has to flee with her father to the mountain refuge because of her magical abilities. She is very insecure and shaken by the unfolding events and the fact that her father gets killed along the way. She doesn't know what to expect from the exiles and her new life among them. I liked that she bonded with Rike and Garrick, the two exiles that helped her and her father during their journey, and expecially Rike is a very interesting character. But Tei's perspective is frequently intermitted by two other perspectives and I felt like this was the reason I couldn't really connect with her. There's one scene in particular where there is a lot of "telling" instead of "showing". Tei goes on a journey to bond with her protector and we are told that they really felt closer at the end of it and that Tei had grown since she came to the mountains. There is simply too little time with Tei to see her development and the connections she makes with people around her unfold. One of the two other perspectives mentioned earlier is Brogan's. He is a simple farmer on Kalaya when his father gets ill and he has to take over his seat in the Assembly. He gets in contact with magic early on when he discovers that his farm helpers daughter can wield it, but he doesn't believe in the rumors and wants to protect her at all costs. I liked that we get to see the Assembly with its leader Rathnor through his eyes and how Rathnor carries out his campaign against the exiles and all magic wielders on Kalaya. However, I would have liked more details about Rathnor's motivations and actions, since he is the story's villain and I prefer my villains to have some motivation apart from just being evil for the sake of it. The last perspective takes us to the other island I mentioned earlier. We follow Farrell, who is the current commander of the Stone Haven fleet. He has a heavy burden to carry since his deceased father was the man who saved the people from being slaughtered by pirates and brought them to this island. He is in charge of sailing the isles around Stone Haven to bring back food and other materials that aren't easy to get or cultivate on his new home. Even though I can't pinpoint exactly why, I liked his perspective the most. There's also a counsel ruling Stone Haven that feels very similar to the one on Kalaya. I'm very curious to see how Farrell's, Tei's and Brogan's storylines will correlate and what will happen to the people of Stone Haven. Overall, the story and the characters have a lot of potential and I enjoyed reading this book. There are a lot of times where we follow the characters on their way from one point to another and I feel like this could have been cut in favour of getting to know the characters even better and to give the world a bit more depth. Nonetheless, I would recommend checking out this book if you like fantasy stories that take a twist on the well-known chosen one trope and that are told from several point of views that feature different parts of the world contributing to the overall story. 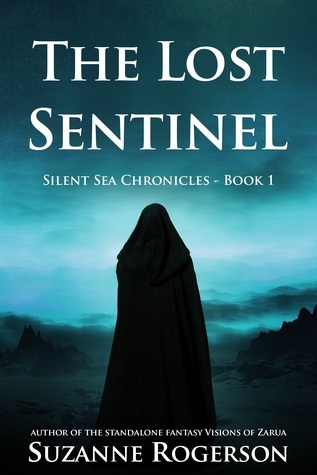 The Lost Sentinel by Suzanne Rogerson is the first book in the Silent Sea Chronicles. It is told in the third person perspective from a full cast of characters, and takes places in the fictional world of Kalaya. The world is made up of mystics- those who have the ability to wield magic, and protectors- those who protect the magic users. However, the current sentinel is dying, and if the next sentinel is not found in time the magic of Kalaya will die too. There were a number of things that I did and didn’t enjoy about this novel. I admired that the author wasn’t afraid to make sacrifices throughout the story, as this made the novel more gripping, since no character was truly safe. These unexpected moments throughout add great suspense to the novel, which keeps the reader on the edge of their seat. The multiple points of view enable the reader to experience events unfolding from different perspectives. I really like this in novels, as often we a biased account of events when novels are told from the first person perspective of just one character. It also enables the reader to whiteness other events occurring on the island of Stone Haven, and the impact these events will have on Kalaya both in this book and future books. On that note, I liked how well the ending of this first book sets the scene for the next book in the series. I won’t give too much away, but there is a certain character guiding the leader of Stone Haven who is thought by this leader to have good intentions, but is later revealed to have his own nefarious agenda. Unfortunately, I feel that the main downfall of this novel is the lack of character development. This is most apparent with the character of Tei. She is a girl who loses her father in the first few pages of the book, and she has island magic. She is the main character of the book, yet I found it difficult to connect with her. This is because there wasn’t enough of the story told from her perspective, and so it was difficult for me to become invested in her character. At the same time however, I feel that this is something that can be improved upon in the next book, as the reader will get to know her character, as well as others in more detail. Another aspect of this book that I didn’t enjoy was the relationships formed in this novel. I felt they were too rushed and underdeveloped, characters falling in love when they hardly knew each other. It was difficult to support some of these relationships as I didn’t see them as being very genuine. However, I think this is something that future books can be built upon, as there will be more opportunity to get to know the characters. Finally, the pacing of the novel. It felt rushed in places, the storyline moving too quickly, which resulted in a lot of ‘telling’ instead of ‘showing’. I also think that more time should have been dedicated to the major moments in the novel, to flesh them out and make them more memorable for the reader. Finally, this is a fantasy series I would like to read more of, as I feel that the aspects of this novel that I didn’t enjoy can be improved in future books in this series. I give this book a rating of 3 out of 5 stars. Most of all, I just need more time to get to know and love the characters! Thank you to the author Suzanne Rogerson for sending me an e-book of this novel to review. Would the mention of people being hoodwinked into acting against their own interests by an unscrupulous political leader, exploiting their ignorance and prejudice to persuade them to scapegoat a minority group for all their problems, cause you to think of real world events? It probably would; as would the plight of refugees; as would hardships brought about by environmental issues. In this respect, The Lost Sentinel (book 1 of a new fantasy trilogy) by Suzanne Rogerson, is a very topical novel given that theses themes very apparently served as inspiration for the story, and are central to its plot. The principal setting for this first book of the Silent Sea Chronicles is the island nation of Kalaya. It is a land imbued with magic, connecting it inextricably to the islands minority population of mystics who are able to use this magic. But Kalaya’s magic has been diminishing, bringing with it hardships such as the failing of crops. This state of affairs has resulted in antagonistic feelings towards the mystics by Kalaya’s majority, non-magical inhabitants, provoked largely by the ruling body called the Assembly that has enthusiastically scapegoated all the island’s mystics. In their ignorance, the people have embraced the persecution of the mystics and their protectors, eventually driving most of them into exile in the mountains, little realising that the well-being of the island is directly linked to the well-being of the mystic population in general, and their leader known as The Sentinel, in particular. It is against this backdrop readers are introduced to the book’s heroine Tei, a young mystic raised since birth by her single father, Migil, who has always taught her to conceal her magic. The story begins in earnest when Tei finds her world turned upside down in the wake of a mysterious stranger visiting her father. Subsequent to the visit, Migil insists that it is no longer safe for them to remain in Seatown, and that he and Tei must leave their old life behind to join The Exiles living in the Turrak mountains. Unsurprisingly, the journey isn’t quite that simple; there are forces at work intent on preventing them from reaching their destination, embodied by a shadowy group of hunters known as the Masked Riders. Unbeknown to Tei, she has a destiny to fulfil that will have a major bearing on the future of Kalaya; a destiny brought into sharp focus by a shocking revelation made in the aftermath of a deadly attack. It would be easy to assume that The Lost Sentinel is yet another cliché fantasy tale of an orphaned “chosen one” who is destined to save the day. Initially, that certainly seems to be the case; and it’s actually not too far from the truth, as it happens. However, Tei isn’t technically the chosen one of the tale, although she does have a key role to play in helping The Exiles to locate the book’s titular character (who must be found in order to succeed the aged and dying current Sentinel) before they can be hunted down by those working for the nefarious leader of the Assembly, Rathnor, who clearly has a hidden agenda for wanting to wipe out the mystics of Kalaya. As is often the case in fantasy, the utilisation of any well-worn trope can make a story easy to predict. In that regard, it’s fair to say that The Lost Sentinel progresses in a rather predictable fashion. The one genuine surprise is Rogerson’s willingness to kill off her characters; not even prominent, main characters are safe. But that being said, it’s still an open question as to how much readers will care about the demise of these individuals. Though it can be taken for granted that most readers will be sad at the passing of the more likeable characters, there remains a distinct possibility that at least some readers will feel as though they didn’t have the opportunity to get to know these characters well enough to be affected by their untimely deaths. It’s probably worth mentioning the one viewpoint character who really stands out from the rest, not necessarily because he is the most interesting, but because he is at the centre of a secondary storyline that, though connected to the main plot, feels very tangential to it. Farrell is the commander of the naval fleet of a refugee population living on a harsh, barren island, called Stone Haven, who unwittingly finds himself embroiled in a conspiracy to instigate war against the mystics of Kalaya, after being contacted by a mysterious telepathic voice. Due to how disconnected this storyline feels from the events taking place on Kalaya, it would have been better for the book, structurally, if this sub-plot unfolded in chapters dedicated solely to it. Unfortunately, though this storyline is a compelling one, the decision to have Commander Farrell’s scenes regularly interspersed with those of characters on Kalaya, within the same chapters, occasionally makes those scenes feel like interruptions. The aforementioned gripes are, admittedly, subjective and will not likely resonate with readers who favour fast moving, action-packed narratives. More detail oriented readers, however, would probably be happier if some of the pace and action was sacrificed for the sake of deeper characterisation, and more immersive world building. An increased focus on the core characters, in particular, may have provided longer character moments that could have given readers further insights into various individuals, in terms of personality, motivations and backstory. As it is, the swift narrative means readers won’t really get to know the characters as well as could have been the case. On the whole, the main characters feel more like casual, passing acquaintances rather than close, intimate companions. The rapid pace also impacts the believability of certain aspects of the book’s character dynamics and relationships. Because it is easy to lose sight of how much time has actually elapsed, in story, over the course of a brief number of pages, it is easy to forget how long characters have known each other for. Consequently, readers can be forgiven for being confused by just how upset Tei is about the death of a character she first met, seemingly, no more than two dozen pages earlier; though a reminder that a few months have passed during those pages makes it more understandable. However, even taking the passage of time into account, the various romantic entanglements that occur are much harder to reason. It just doesn’t ring true for characters to fall in love with people they barely know (in Tei’s case, with someone she hasn’t actually met yet), not to mention how strange it seems when a character is lusting after somebody, one moment, only to be rolling around beneath the sheets with someone else shortly after this person’s death. Having initially been attracted to the book due to its similarity to Glenda Larke’s, The Last Stormlord, at least in terms of the basic premise, it has to be said that any similarities between the two books ends there. The Lost Sentinel lacks the more sophisticated political intrigue found in Larke’s tale; nor does it possess the intricate world building that characterises her book, though this is obviously an unfair comparison as very few novels have settings realised in such great detail and originality as that which graces Larke’s work. But it is certainly the case that readers who are drawn to deep and rich world building will probably find Rogerson’s setting a little too shallow for their tastes. That being said, one of the highlights of the book does come from the author’s world building; it takes the form of an alternate plane of existence that Kalaya’s mystics can reach while in a trance like state, allowing their souls to leave their bodies to enter the Astral Plane. Rogerson’s depiction of the Astral Plane, and the events that take place within it, is actually very cool. All in all, The Lost Sentinel is an enjoyable read with the requisite qualities that will see it find favour among the young adult fantasy audience. It might not be appreciated to the same extent by people outside that readership, some of whom may feel that the book lacks the necessary depth and sophistication in its writing to be quite as rewarding a read. This shouldn’t be interpreted as The Lost Sentinel being poorly written, because it isn’t. Rogerson’s writing style is clear and concise, making her prose very effective at conveying a story; all it really lacks is the literary finesse inherent in the writing of veteran, established authors of the calibre of Jacqueline Carey, Guy Gavriel Kay or Lois McMaster Bujold. Nonetheless, in spite of its limitations, The Lost Sentinel succeeds in doing what every first book of a trilogy needs to do; be good enough to entice readers into wanting to read the next instalment. Before concluding this review, it’s probably worth addressing an issue that is frequently held against books by indie authors. Self-published works have a reputation for being poorly crafted, woefully written, devoid of adequate editing, and generally being in an unfit state to warrant being published. This reputation is not completely unjustified as such books are very easy to come across. But prospective readers of The Lost Sentinel can rest easy in the knowledge that it isn’t one of these novels. While you will probably spot the odd typo, here and there, it won’t be significantly more than you would expect to encounter in a traditionally published book. You might also stumble upon the occasional awkwardly worded or structured sentence, but nothing sufficient to detract from the reading experience. In conclusion, The Lost Sentinel is an action-packed tale that makes good use of some interesting, topical themes, making it well worth a read. It also provides more than adequate evidence of Rogerson’s storytelling chops. If she can build upon this in future by finding a more harmonious balance of plot progression, character development, and world building, then coupling it with stronger writing, there is no reason why she cannot eventually become yet another self-published fantasy success story alongside an author like Michael J. Sullivan. This is the second book of Suzanne Rogerson’s that I have read so I felt that I had some sort of idea of her writing style but wow has she raised the bar. What makes it even more exciting is that this is the first book in a trilogy so I know it is going to be one hell of an epic journey for both the characters and readers alike. I soon developed character envy after reading the opening chapter, Tei even as a child, had the gift of leaving her body and wondering as a spirit on the astral plane, p This is the second book of Suzanne Rogerson’s that I have read so I felt that I had some sort of idea of her writing style but wow has she raised the bar. What makes it even more exciting is that this is the first book in a trilogy so I know it is going to be one hell of an epic journey for both the characters and readers alike. I soon developed character envy after reading the opening chapter, Tei even as a child, had the gift of leaving her body and wondering as a spirit on the astral plane, pretty cool, but there are some rather dark forces there that need to be avoided. She is warned to keep her abilities secret or else she will put herself in grave danger. Nine years later a knock on the door results in Tei and her father leaving their home to find safety in the Turrak mountains as the hunt to rid Kalaya of anyone with special abilities is enforced by the Assembly. Kalaya’s economy, crops and good fortune are failing because the Sentinel that radiates magic into the Island is slowly dying. The failures have then been blamed directly onto anyone with any sort of magical power which in turn has caused quite a ‘witch hunt’ for the sake of a better couple of words. Tei and her father flee only to be pursued. As more of the Islands population decreases it become imperative that a new Sentinel is found but the problem is no one knows who it could be. When tragedy strikes Tei and her father she has to put her trust with two strangers that become her protectors. They know that Tei is to play an important part if the Island is to be saved. Now I don’t think anyone will read this book without really loving Garrick. He is a top notch bloke in every way possible, a little swoon here I think. The story takes a turn as Tei is not only hunted she is also now the hunter to find the next Sentinel. This journey becomes an absolutely top class quest to find the one person that could possibly be the special one. It isn’t like just anyone can take on the role. I felt like I had a good connection with the characters and I understood most of their thoughts and feelings. I would have liked a bit more depth with their development but I was still satisfied with what I knew about them. Tei was clearly a confused young woman and I understood her troubles and fears. I was a little thrown by the development of her love interest but the rest of her character seemed quite believable. There were lots of point of view changes and this sometimes interrupted the flow of the book. There was one character, Farrell, that particularly confused me early on and I was unsure why we were being told his story. I would have suggested holding off on his story until a bit later in the book to allow more focus on the other main characters in the early stages. I found the beginning of the book fairly predictable, but the predictability significantly reduced soon after. Some of the events and outcomes really took me by surprise. I occasionally felt a little impatient with the pace of the advancing plot. There was always something happening but it felt like it took a long time to get to the main part of the story. However, this left me wanting answers, which is a good quality for a book to have. I also do not quite understand why the sentinel was lost in the first place. This might be explained in later books but I think more detail about the subject should have been included. I was confused by the use and limitations of magic. There did not seem to be clear rules for what magic could be used for and so I had no idea what characters were capable of doing. I absolutely loved the visual descriptions. I do not think I can stress this point enough. It is my favourite aspect of this book. The level of description goes well beyond anything I have read recently and I never found myself unsure of what a place looked like. This alone is enough to make me want to read more and it definitely motivates me to step up descriptions in my own work. This book was really well written. The sentences flowed well and the quality of writing really stands out. I came across a few errors like missing capital letters at the start of a sentence, and maybe a sentence or two that seemed a bit confusing, but the rest was great. It was easy to forget that this was only the second published book for the author. The detail in the writing was also strong and descriptive. I found myself in tears over the death of a character that was never even introduced just because the funeral was so emotional. I know I have picked out several things that I would have liked done differently, but this really was a great book. It has definitely sparked my interest for the rest of the series and I look forward to the release of the next book. Wow, after reading this book I am emotionally drained…but in a good way. ‘The Lost Sentinel’ is the first book in the ‘Silent Sea Chronicles’ fantasy series and is an amazing read! The book starts by introducing us to a young Tei who has the ability to walk the Astral Plane but has a terrifying experience while there. Nine years later and Tei’s life is shattered when she and her father have to flee their home in order to be safe. At first the story was easy to get into. The action surrounding Tei Wow, after reading this book I am emotionally drained…but in a good way. ‘The Lost Sentinel’ is the first book in the ‘Silent Sea Chronicles’ fantasy series and is an amazing read! The book starts by introducing us to a young Tei who has the ability to walk the Astral Plane but has a terrifying experience while there. Nine years later and Tei’s life is shattered when she and her father have to flee their home in order to be safe. At first the story was easy to get into. The action surrounding Tei running away and what happens when meeting with Rike and Garrick was exciting to read and I really got into this book right away but as the tale progresses we are introduced to more characters and more viewpoints and the story becomes more complex and interesting. The book is written in the third person but jumps about between several different characters throughout the story. Although this was hard to grasp at first, it felt like a movie. Everyone’s tales are different with most stories happening on the island of Kalaya, but not all. Each story seems unconnected to anyone else’s at first, but as the plot progresses the connections are revealed and each story is an exciting one on its own. The plot is really dark. There’s an undertone of darkness and fear already, with what Tei experienced as a child and the overall fear of being caught, but the whole book really has a dark edge with a lot of death including some key characters which leaves you shocked and upset and maybe even crying…I actually had to take a breather when reading these moments as it was so unexpected. But these deaths soon make sense to the plot and I am amazed at how unpredictable and good this book is to read. Being a darker fantasy read there’s some violence and deaths but very little swearing with a rare few uses of the b words and only one use of the s swear word. There’s nothing else offensive in this book. Although the story has a really dark undertone with shocking moments, I really enjoyed it. I love a dark plot and this book really doesn’t disappoint with shocks and surprises throughout. I do have one criticism though and it’s a shame as it’s the only reason I give this four rather than five stars. As I’ve said the book changes viewpoint often which makes it more exciting and really pushes the overall plot forward, however this viewpoint switching happened too often in the beginning. While Tei’s storyline was easy to follow and grasp in my mind, as the first chapters were only about her (meaning I got to know her well and the characters she meets), I struggled to remember the other characters and their storylines. I did have to put down the book for a day as life got in the way, which didn’t help, but getting back into everyone’s stories except Tei’s was hard as I forgot who was who at first. It wasn’t until I was about a quarter of the way into the book before I really started to enjoy it and solidified all the characters and their individual stories into my mind. Overall this is an amazing and gripping fantasy read. It’s a long book but filled with a lot of great action and a perfect fantasy setting ( there are no fantasy type creatures just humans). The world of Kalaya is rich and dark and I’m amazed at how sucked into the action I was reading this, and how unpredictable and dark the storyline is. The ending is a satisfying one but the story is far from over, it’s only beginning and sets up questions for the next book in the series and I can’t wait to read it! I will admit that after Visions of Zarua I had set the bar exceptionally high for Suzanne Rogerson, probably unreasonably high for any author to have to live up to and I’m just glad that as bloggers we don’t tell authors about these invisible bars we sometimes set because I may have given the poor author a heart attack with this one. But not only did Suzanne Rogerson meet my expectations with The Lost Sentinel she surpassed them. Let’s talk ab This review originally appeared on BrizzleLass Books. Kalaya is a magical island, beautiful and filled with mystic’s who have varying degrees of magical power. But the island is dying, as is the leader of the mystics the Sentinel. When Tei escapes to Turrak to join the mystic exiles she discovers she is responsible for finding the next Sentinel before time runs out. Surrounded by some wonderful characters who get under your skin almost from the start Tei sets out on a harrowing journey which is heartwarming, moving, and terrifying all at once. I was deeply moved by Garrick one of the protector’s, humans who are responsible for protecting the mystics, he is deeply in love with Tei but this isn’t what was attractive about him, it was his humour and inner and outer strength. Of all the sub-characters he was the one I looked forward to seeing on the page the most. The world building throughout this novel is exquisite, I felt like I could live and breath Kalaya, and while at sea with Farrell and the Stone Haven traders I felt consumed by the ship and the life of these sailors. I didn’t once feel uncertain or confused about what was happening, where, or why. All of the characters good, evil, or indifferent have deep backgrounds, and something about them that makes them appealing on the page and makes you want to keep reading digging deeper into their story and how they fit into the bigger picture. There is a huge cast of characters in this book and by the end we don’t get the answers to every question because of this being part one of a series but there is a definite sense of direction. I Also like that Suzanne Rogerson is a fantasy writer who isn’t afraid of killing important characters. We lose characters in this novel that you would absolutely consider vital to the story. I reached a point where I couldn’t see the page through my tears, now as hard as it is to read that it’s also really important to lose those characters sometimes to make way for the story to progress and I applaud Suzanne for having the bravery to let that happen. Overall, this story bowled me over, it was an absolutely outstanding epic fantasy and the kind of writing fantasy authors should be aspiring to. The only negative I have is that I’m dreading the wait for book two. Fantasy lovers need to be celebrating right now because “The Lost Sentinel” is being released this week! You do not want to miss this first in a new series from Suzanne Rogerson. The story takes place on the island of Kalaya where the magic that sustains life on the island is dying. Tei and her father are forced to flee their home in the night because Tei has a magical gift. The Assembly is cracking down on those with magic in an attempt to completely rid the island of magic. Tei must flee to th Fantasy lovers need to be celebrating right now because “The Lost Sentinel” is being released this week! You do not want to miss this first in a new series from Suzanne Rogerson. The story takes place on the island of Kalaya where the magic that sustains life on the island is dying. Tei and her father are forced to flee their home in the night because Tei has a magical gift. The Assembly is cracking down on those with magic in an attempt to completely rid the island of magic. Tei must flee to the mountains of Turrak, the only place where those with magic can live in peace. When she arrives in Turrak, she quickly learns that she is the Confidante to the next Sentinel. The problem is no one knows who the next Sentinel is, and Tei is the only one who can find out. After her harrowing escape, and being narrowly rescued by Rike and Garrick, Tei must quickly learn about her power and then embark on a dangerous journey, always looking over her shoulder for the Masked Riders who would destroy her. A solid 3.5 savvy crowns. Initially, I was so intrigued by the idea of this, Tei was a likable character and drew me into the story, but soon into the story more than a few characters were dropped in and I found the stories began to branch off. For me, this caused issues because A solid 3.5 savvy crowns. Initially, I was so intrigued by the idea of this, Tei was a likable character and drew me into the story, but soon into the story more than a few characters were dropped in and I found the stories began to branch off. For me, this caused issues because I lost sight of the main story and at some points, I found myself a little frustrated because I wasn't trying to remember what the premise is about. When it came around full circle back to the main story I enjoyed it, but the distraction of the supporting roles was just - well it was distracting. If you're not easily distracted as a reader then I don't think you'd have the aforementioned problem like I did. Each character/side story is an interesting one, to be sure, that adds up to the main story. Each character is relevant, each character achieves something, but for me, it was just an overload. So if you're into high fantasy, definitely consider this read. The story basically proceeds in three parts, one follows Tei and her search for the Lost Sentinel, the second follows Farell and the people of Stone Haven who just want a good life away from the hardships they have to endure day in and day out. Lastly there is Brogan, an apparent singleton who hates the oppression of the Assembly against magic in the land. Even though these seem poles apart, they go along well. Two of the flows even meet in this book itself and I can clearly see how the third one will join in! This book introduces you to Tei whose life takes a turn after an old friend of her father's warns them to leave their life behind. With "The Lost Sentinel", Suzanne Rogerson presents us with several interwoven plot lines, one covering Tei and her companions, another getting closer to Brogan, and a third one is on Farrell. All plot lines are relevant, even if I admittedly had a ranking for them i.e. one that I could not get too warm with. The story is skilfully elaborated, comprises interesting tu This book introduces you to Tei whose life takes a turn after an old friend of her father's warns them to leave their life behind. With "The Lost Sentinel", Suzanne Rogerson presents us with several interwoven plot lines, one covering Tei and her companions, another getting closer to Brogan, and a third one is on Farrell. All plot lines are relevant, even if I admittedly had a ranking for them i.e. one that I could not get too warm with. The story is skilfully elaborated, comprises interesting turns, and has a great flow. Suzanne Rogerson introduces each character with finesse, providing them with sufficient depth for their respective relevance. I was drawn into the story right away - very close to Rike and to Brogan, highly appreciating their integrety. I will presumably get closer to Tei in the second instalment, when she has gained a little more maturity. I could easily envision the characters and locations. I had a great time reading "The Lost Sentinel". It is a very enjoyable read. This is for you if you like urban fantasy, very likeable characters to cheer on their thrilling trip, integrity, surprises, and great storytelling. The magical island of Kalaya is dying, along with its guardian, the Sentinel. This is caused by the ruling Assembly with their determination to rid Kalaya of magic and the people who practice it, thereby giving them total control of the island and its inhabitants. The people go along with this, for they are starving and believe that magic is the cause. As the people turn their backs on magic and the people who use it, Tia is forced to flee to the Turrak mountains with her father to join the other The magical island of Kalaya is dying, along with its guardian, the Sentinel. This is caused by the ruling Assembly with their determination to rid Kalaya of magic and the people who practice it, thereby giving them total control of the island and its inhabitants. The people go along with this, for they are starving and believe that magic is the cause. As the people turn their backs on magic and the people who use it, Tia is forced to flee to the Turrak mountains with her father to join the other exiled inhabitants. Shades of Game of Thrones here, as the leaders of Kalaya battle to be victorious against the Exiles. I began to despair of Tia’s future, convinced that she was the lost sentinel. This was enforced by the conversations she has with the dying sentinel. But when the dying Sentinel declares Tia as the ‘confidante’ to the next Sentinel, I hoped he was wrong. I knew this book to be the first in a series but was unprepared for such a cliff-hanger at the end. The people of Kalaya had a new sentinel, but it wasn’t Tei after all. Their new world was a mess with more disasters looming. There are several villains in this story, and I was hard pushed to say who was the worst. I have the feeling it will turn out to be Rathnor, as his motives are the strongest. Although I was a little disappointed there wasn’t a little more magic in this story, it was a frustrating and exciting beginning to what promises to be an extraordinary series. I would like to thank CreateSpace Publishing and the Netgalley website for this partnership. The story takes place on the island of Kaya which is magical but she is dying. All those who use magic are exiled in the mountains. Tei, a tailor's daughter, hides her magic but one day she is forced to flee to the mountains. But on the way her father is wounded to death, he will reveal things to her that she never thought she would discover one day I would like to thank CreateSpace Publishing and the Netgalley website for this partnership. Tei, a tailor's daughter, hides her magic but one day she is forced to flee to the mountains. But on the way her father is wounded to death, he will reveal things to her that she never thought she would discover one day. She will have to find the sentinel, the only person capable on this day of restoring magic. But she's wanted by some strange riders. A first book full of suspense and twists and turns as well as a captivating, moving story. I loved the characters, looking forward to discovering the book two. The Lost Sentinel is a character driven fantasy set in the beautiful land of Kalaya. Here the magic runs deep through the land, giving to the people and as they pass on, their magic is absorbed back into the land. The Sentinel guards the magic, holds it tight, protecting Kalaya and the people, but as times pass people begin to forget. People with magic are exiled, new people rule who begin pushing for magic to be banned. Things are going wrong on the astral plane as well, souls aren't making it through the gates, there is something in the dark, waiting, lurking, taking the souls for itself. This book was entertaining with good world building. While I enjoyed the characters, they could have been developed a bit deeper. The pacing of the narrative is a bit quick and I wanted to have more time to understand the characters. The frequent Point of View changes and scene breaks were a little distracting as well. So for me, the story flow could have been smoother. Even with these pacing issues, the story is well-written, the characters believable, and the plot entertaining. The different c This book was entertaining with good world building. While I enjoyed the characters, they could have been developed a bit deeper. The pacing of the narrative is a bit quick and I wanted to have more time to understand the characters. The frequent Point of View changes and scene breaks were a little distracting as well. So for me, the story flow could have been smoother. Thank you to Xpresso book tours for the arc of this book. I enjoyed this book from start to finish and look forward to seeing how this series evolves. This was my second venture into a Suzanne Rogerson and I was not disappointed! Suzanne has a wonderful way of bringing to life multidimensional characters and vibrant worlds that leap off the page. She weaves amazing plots that come together though threads are disparate at times. She truly has a grasp on the workings of fantasy and her prose brings that to life. There's a great journey feel to the book, with a lot of characters travelling through the terrain that Suzanne brings strongly to life, w This was my second venture into a Suzanne Rogerson and I was not disappointed! There's a great journey feel to the book, with a lot of characters travelling through the terrain that Suzanne brings strongly to life, which is always a highlight for me in books. Another excellent feature in this book is the magic system which has one foot rooted in nature and another on an astral plane. Tei, our main character, is able to move between the two, bringing to life a balance that has a profound thematic impact. She wrote her first novel at the age of twelve. She discovered the fantasy genre in her late teens and has never looked back. Giving up work to raise a family gave her the impetus to take her attempts at novel writing beyond the first draft, and she is lucky enough to have a husband who supports her dream - even if he Suzanne lives in Middlesex with her hugely encouraging husband and two children.